Space Systems/Loral (SS/L) announced in April 2005 completed design reviews of TerreStar Networks, Inc.'s geostationary satellite, TerreStar-1, and entered into the construction phase of the Mobile Satellite Services (MSS) program. The TerreStar satellite, together with an Ancillary Terrestrial Component (ATC), is designed to provide next-generation, 2 GHz mobile voice and data communications, monitoring and messaging services throughout the United States. Scheduled for delivery in 2007, TerreStar-1 has a service life of 15 years and will carry a state-of-the-art MSS payload featuring a large unfurlable reflector. The satellite will be capable of generating hundreds of spot beams covering the Continental U.S., Canada, Alaska, Hawaii, Puerto Rico and the U.S. Virgin Islands. SS/L's contract with TerreStar also includes an option for construction of a second satellite, TerreStar-2. An FCC decision earlier this year opened the door for TerreStar Networks, and other select satellite operators, to incorporate an ATC with its satellite-delivered communications service. The previously unavailable 2 GHz frequency band will allow MSS operators to provide advanced mobile voice and data services. These services will be enhanced by ATC technology, which allows for coverage in areas where a satellite's signal could be blocked, including urban canyons, dense forest or other areas out of the satellite's line-of-sight. TerreStar-1 is based on SS/L's space-proven SSL-1300 platform, which has an excellent record of reliable operation. Its high efficiency solar arrays and lightweight batteries are designed to provide uninterrupted electrical power. 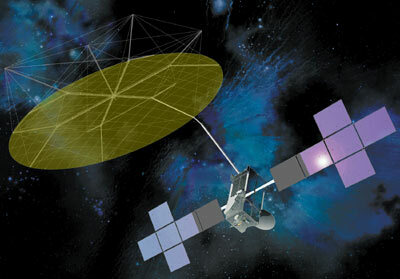 Dish Network Corporation (EchoStar) acquired substantially all of the assets of TerreStar Networks in March 2012.